Bowling is a 12 week season. Each week, teams will compete in 3 games against each other. Teams will bowl to obtain their handicaps the first week of the season. From there on out, handicaps will be adjusted after each week's matches. There will a 9-week regular season, and a 2-week playoff. The Winter Season will begin play starting on January 17th on Thursdays. Averages update weekly and handicaps will be in use. The league will play at Parkway Lanes each week, located on South 12th Street in Allentown. The games will begin at 7:15pm each week. Teams are asked to arrive by 7:00pm for a warm-up period. Teams will play 1 match each week (3 games). Playoff tournament is single elimination, however, all teams will be able to play every week throughout the playoff weeks. Price is $135/person or $540/team (3.5% processing fee). Price includes 3 games per night, shoe and lane rental, league administration (averages, scores, standings, schedule), and league t-shirt. Winning team will receive a gift card back to the bowling alley. 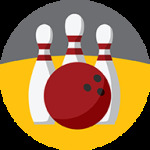 Check out this Bowling league '19WIN - BOWLING' with Lehigh Valley Leagues!